Over the last few years, within the graphic design/illustration community, there has been an emergence (or more accurately a resurgence) of a particular kind of stencil printing using a machine called Risograph — pronounced rise-o-graph (at least that’s how I say it). A number of printers/studios have been providing a service based solely around this machine for a short while now. Speaking of instant mini-studios, I went to see a mate who agreed to let me have a go on his RISO to produce the print you see above. Most of the people in the UK who work with these machines are based in London, with not that many others further afield. 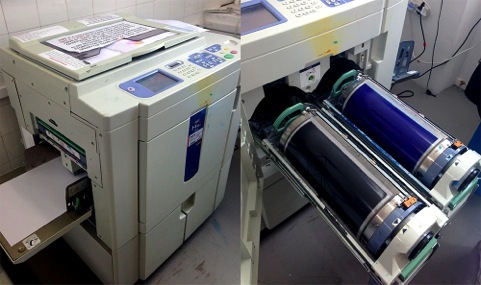 It’s quite a primitive process; you have to work in colour separations so each gets its own stencil around the ink drum. Once the first colour is down you then have to create a new master, feeding the printed artwork back through the machine to overlay the next colour. The machine has a selection of spot colours to choose from (including fluro orange and pink) which have to be removed and installed as you change colour. Forget about CMYK, the RISO pioneers get around this by using tints of Blue & Red ink along with Yellow & Black. You can never get the registration quite right using a RISO – often times you just feed it through and hope for the best, on a good day it’ll usually be 1 or 2mm off. They can be a real pain to work with at times, each machine having its own niggles you have to watch out for. I think the phrase that sums up the printing experience would be ‘happy accident’. 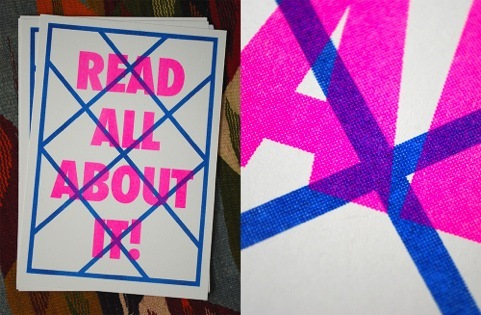 You gotta love a good RISO print!